Stop Ants On Marijuana Plants Now! In general, ants are useful creatures to have in the marijuana garden. Hence, spotting an ant or two on the plants is not a cause for major concern especially in a well-kept environment. But in large numbers, they can indirectly cause many problems that may injure the crop. Like earthworms, ants are a natural part of the outdoor setting. As such, they help aerate the soil which provides more oxygen to the roots. In addition, they create more nutrients for the plants by decomposing dead insects. However, they become an issue when they become too many for the garden to handle. In extreme cases, the ants create mounds of soil that disrupts the plant’s absorption of water and nutrients. As a result, the roots are damaged and bud production becomes compromised. Also, a colony of ants tends to come with pesky pests like aphids, and mealybugs. Left unchecked, these critters will further destroy the crop and leave us with nothing to harvest. To remove the ants, this article will cover some preventive measures which are also excellent treatment methods. Luckily, these tips are natural and safe for the plants as well as to animals and humans. But first, let’s learn the signs of a possible ant problem. When pests attack the plants, they often leave visible signs which help us figure out which critter is responsible. In the case of an ant infestation, one indicator is the presence of aphids and whiteflies, as well as mealybugs. There are other tell-tale signs, so make sure to know them so we can act fast to remedy the problem. As mentioned, ants are common in a healthy ecosystem especially outdoors. But if we see a swarm of them crawling near the plant, then it’s a clear sign of an infestation. It also means that something in the environment is out of balance. While tracking the ants can be tricky, it’s important to locate their nest so we can shut them down. To do this, simply follow them as they will lead us to one or two of their colonies. When we spot earthy mounds that aren’t supposed to be there, then suspect the ants are dominating the garden. Of course, we don’t want them building colonies as this will cause root damages. Also, it’s only a matter of time before they start scavenging in the kitchen. So, start preparing ant repellents and apply them fast before it’s too late. As mentioned, ant infestations ruin the quality of the soil and cause plant problems. Hence, it’s common for the crop to start showing changes in appearance such as yellowing of leaves. In severe cases, they may also start to droop which is a sign of dehydration. Worse, this condition may lead to lower resistance against molds and diseases. Ants have a complicated relationship with other insects that feast on the marijuana leaves. While the ants are protecting these pests from predators like ladybugs, they’re also farming them. This is due to the “honeydew” these insects secrete which is irresistible to the ants. So, if we spot some of the aphids, expect to find some ants, too. Although it’s true that the ants will kill the aphids for food, it also means that they’re creating a home for these pests. This means double trouble for our precious plants as both the ants and aphids are bad news. Hence, eliminating them is our priority. Luckily, once we get rid of either pest, this reduces the chances of survival of the other one. When removing ants, keep away from harsh chemicals and pesticides as they often do more harm than good. Fortunately, there are many organic and safe options to eliminate these pests. Best of all, they’re perfect as preventive and treatment methods. In this section, we will discuss how to apply them to get the best results. Remember how important it is to track down where the ants live? This is so we can knock them down with cinnamon, cayenne pepper, or ground coffee. Upon contact, these ordinary house ingredients repel and kill the ants in a matter of minutes. In particular, ground cinnamon gets the job done the quickest. To use, find an ant-prone area and simply sprinkle a tablespoonful on it. This will freak the ants out and keep them from returning to that spot. If we find their colonies, use an extra dose of cinnamon by mixing it with the same amount of water we that we give the plants. Then, pour it over the mound to send the ants packing. We can also pour this on the topsoil around the plant to make sure they don’t come back. To keep the ant population down, sprinkle some cornmeal into the openings of anthills. Because of its tough material, cornmeal is harsh on the ant’s guts and cause them to die from indigestion. As a bonus, the bodies of the dead ants will decompose in the soil and add more nutrients to the plants. As mentioned, ants are attracted to the sweet sticky substance produced by pests like aphids. Other insects that secrete honeydew are the whiteflies and mealybugs. So, getting rid of them takes care of our ant problem. In general, the best way to prevent all kinds of bugs from settling in the garden is to keep it clean. So, make sure to throw clippings or rotten plant parts and dispose of them properly. Also, practice the correct watering techniques to avoid overwatering which attracts these insects. Although ants provide benefits to the soil, they’re not considered as beneficial insects as they destroy root systems. Also, there are other excellent aerators and decomposers such as the earthworms and nematodes. As such, they enrich the soil without posing any risks to the plants. 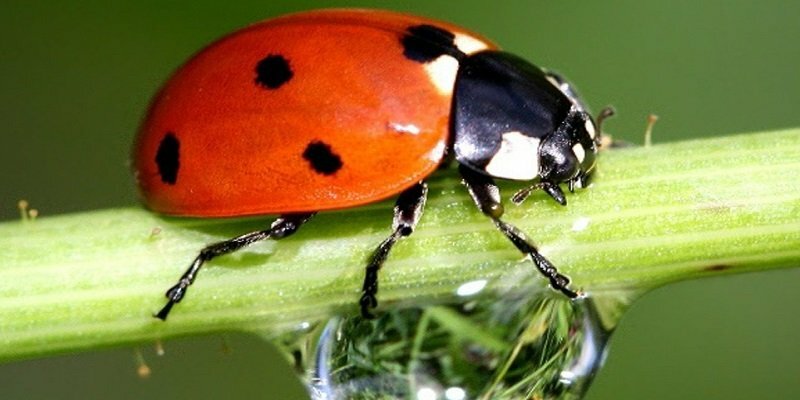 Other good insects are ladybugs and praying mantises which prey on plant-eating pests like the aphids. They also kill aggressive marijuana eaters like mealybugs, whiteflies, spider mites, and even caterpillars. While available online, it’s better to create a garden that invites these helpful creatures. In the long run, they provide a reliable pest control system than other pesticides. A well-balanced environment is the best defense against any type of pests or diseases. To achieve this, make sure to check the pH of the soil every time we add something to it. This includes the ground cinnamon and other natural products discussed earlier. So, get a pH tester and learn to monitor the soil quality. Another great way to optimize the garden is to use high-quality organic compost such as earthworm castings. Overall, we must create a comfortable climate for the crop by providing the right temperature and humidity. Together with the right amount of light and water, these factors will protect our plants from pests and diseases. Above all, this boosts the crop’s ability to produce huge buds. Made from crushed fossils, diatomaceous earth is sharp and deadly to any soft-bodied insects like the ants. As such, it’s an amazing solution to any pest problem especially since it’s safe for plants, pets, and people. To use, sprinkle the powdery material in the soil around the plants. Include other ant-prone areas in the garden as well as the opening of anthills. When the ants make contact, it will cut them open and cause them to dehydrate and die. For the greatest effect, combine it with the strong-smelling cinnamon. As with any other types of pest control, applying natural methods is best for the marijuana plants. This ensures safety to the environment as well as to the person using the buds. Since ants are generally easy to deal with, there really is no use to resort to chemicals pesticides. Bear in mind while ants add some benefits to the soil, they threaten the well-being of the roots. So, make sure to take control of them immediately after spotting signs of an infestation. For a quick remedy, use the tips mentioned in this article. With this information, it’s easy to stop them from ruining our crop. While the methods we recommend are helpful, the best way to avoid plant problems is to start with quality seeds. So, make sure to buy them from reputable sources. Also, find a way to create a nice environment for the seeds to grow in. This way, we don’t have to experience the stress of dealing with pests in the marijuana garden. I have had to same problem with my outdoor crop, I am curious as to what causes that.